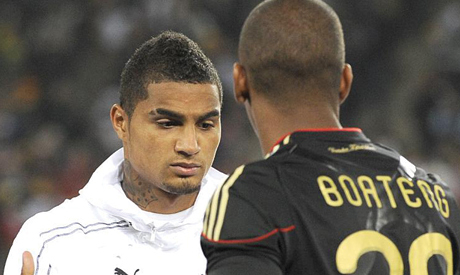 Despite a tough draw for Ghana in the 2014 World Cup, Kevin-Prince Boateng seems delighted to be facing his German brother Jerome Boateng in the group stage for the second consecutive tournament. “Brother it’s time again…that’s how beautiful life is!! Can’t wait…love [you] bro!! !,” he tweeted right after the draw was made. Ghana were placed in Group G along with Germany, Portugal and the United States. The Black Stars will find themselves again in a duel with Germany for the second tournament in a row. Kevin and Jerome used to play together for Germany at the youth level but the former opted to switch allegiance and play for Ghana, his country of origin, after being dropped by Germany's senior side. They came face-to-face during the 2010 World Cup and Germany won the group-stage match via a 60th-minute goal from Mesut Ozil. Commenting on the tough draw, Captain Asamoah Gyan said on his twitter account: "It always seems impossible until it's done. Brazil here we come, it is going to be a hot summer." Ghana, who finished as quarter-finalists in South Africa in 2010, are aiming high, saying they want to improve on their last-eight finish. Kevin Prince was born in Germany, not Ghana. So his country of origin is Germany. His father was born in Ghana.